Study shows that human vision-impaired ‘echolocators’ can substitute echolocation for vision. Certain vision-impaired individuals have the ability to use echoes from tongue or finger clicks to recognize objects in the distance, and some use echolocation as a replacement for vision. Research from the University of Western Ontario and colleagues around the world, is showing that echolocation in vision-impaired individuals is a full form of sensory substitution, and that vision-impaired echolocation experts recruit regions of the brain normally associated with visual perception when making echo-based assessments of objects. The data findings were presented at the 9th Annual Canadian Neuroscience Meeting. The results showed that echolocation is not just a tool to help visually-impaired individuals navigate their environment, they can also act as an effective sensory replacement for vision, allowing them to recognize the shape, size, and material properties of objects. Just like multiple properties (size, expected weight, texture, composition) of an object assessed by visual cues are encoded in different brain regions, the current study shows that the same is true of information obtained through the auditory cues provided by echolocation. Indeed, many of the same regions in the sighted brain that are used for the visual assessment of objects are recruited in the vision-impaired brain when objects are explored using echolocation. The team state that to understand what an object is, and to know how to interact with this object, knowing what an object is made of is equally important as knowing its structure or shape. While initial studies from the team have investigated how echolocators detect the shape and distance of objects, the current study investigated how the vision-impaired perceive the material that different objects are made of. 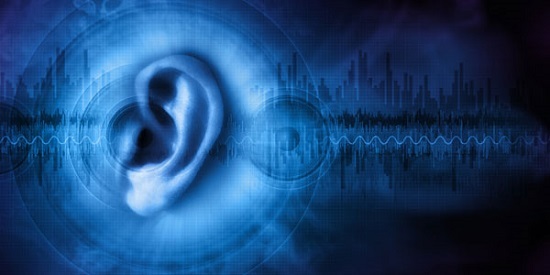 Previous studies have shown that expert vision-impaired echolocators can tell whether something is hard or soft, dense or not, just by listening to the echoes bouncing back from that material. While sighted individuals use visual cues to get information about the composition of objects, such as the sheen of metal, or the fuzziness of fur, echolocators must rely on the auditory cues that result from the echoes of the clicks they emit. To determine how the brains of echolocators process these cues, researchers have recorded the echoes produced by echolocator’s clicks on different materials (a blanket, fake foliage and a whiteboard) and looked at the response these sounds produced in the brains of sighted people, of vision-impaired non-echolocators and of vision-impaired echolocators. To view which brain regions were activated in these individuals, an advanced brain imaging technique called functional magnetic resonance imaging (fMRI) was used. The data findings show that material-related signals activate a region of the brain called the parahippocampal cortex (PHC) in vision-impaired expert echolocators, but not in sighted people or vision-impaired non-echolocators. PHC activation is associated with scene perception in sighted individuals. Just as in sighted individuals using vision, the brain regions that play a critical role in processing the structure and geometry of objects are distinct from the brain regions that process the cues that signal the material properties of objects in vision-impaired echolocators. Interestingly, previous studies from the team have shown that vision-impaired expert echolocators are also subject to illusions, for example the size-weight illusion in which the perception of mass is influenced by the size of an object. If two objects of equal weight are presented to both a sighted and a vision-impaired echolocator, both will find the smaller object feels heavier when they lift it using a string attached to a pulley. This illusion, thought to be based on the lifter’s cognitive expectations, and the fact that it is also present in vision-impaired echolocators, but not in vision-impaired non-echolocators, shows that echolocation is an effective form of sensory substitution for vision. The team surmise that because echolocation allows vision-impaired individuals to perceive objects from a distance, it can be used as an alternative to vision, allowing the perception of distant objects that would be impossible through touch. In fact, say the researchers, some echolocators are proficient enough to use this ability to perform complex tasks such as riding a bicycle, or even sinking a basketball.